Healthy food has been 'in' for a while now; the new trend is eco-friendly food! Yes, you read that right. 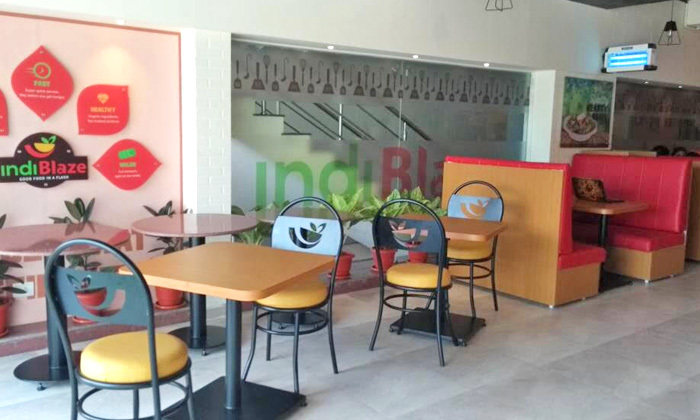 Bringing 'good food in a flash', IndiBlaze is a first of it's kind restaurant in Hyderabad city serving customised food which is healthy, tasty and environment friendly. Keeping today's fast paced lifestyles in mind, IndiBlaze offers live & interactive food counters where you can get your share of fresh and healthy food that comes in interesting varieties and in eco-friendly disposable utensils. This is a place that intends to make you happy, with the food and with the good feeling that you'll get when you know you're not harming the environment by eating in their eco-friendly crockery. The decor too is all about happiness with all the yellows and oranges and more things vibrant! So do your taste buds, your health and the environment a favour (all at once) by eating at IndiBlaze!